Joshua Tree National Park is the closest National Park to my home, so I visit it several times each year. It is a desert park, arid and sometimes quite hot, and given its proximity to Los Angeles it can be crowded on weekends which makes exploring Joshua Tree National Park at night an appealing option. Summer and fall evenings are usually quiet, still and warm, making night photography in shorts and sandals a piece of cake. I have taken thousands of photographs (many of them quite bad) of the bizarre and charming Joshua Tree (Yucca brevifolia) forests that span the park. This image is one of my favorites, showing the trees reaching toward the Milky Way galaxy far above. If you like this image, please see my website devoted to my full collection of Landscape Astrophotography images. Thanks for looking, and cheers! 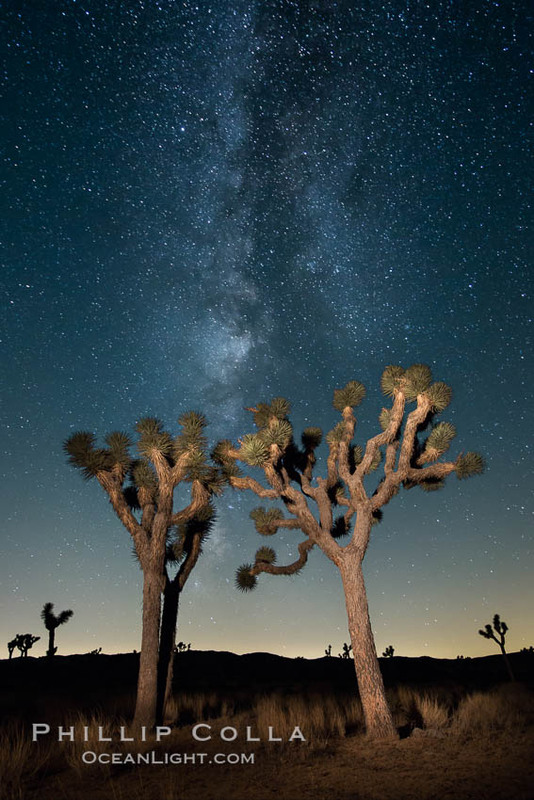 The Milky Way Galaxy shines in the night sky with a Joshua Tree silhouetted in the foreground.